No Cape Cod oyster tour would be complete without a trip to Wellfleet Harbor, home to one of America's most iconic oysters. For the last chapter (in cased you missed them, see: WiAnno, Monks Cove, and off-the-cape Duxbury), I'm very excited to share my adventures on the Puffer Oyster Farm and a peek inside Wellfleet Shellfish Company. 4:45AM, pre-dawn: Michelle and I got up, got dressed, and tiptoed out of the The Holden Inn. We hustled down Commercial Street and across the ghostly quiet beach. Nobody was awake. (We were barely awake.) Time and tide wait for no one, but fortunately for us, our hosts were a bit more patient. We were on our way to rendezvous with father-and-son duo Irving and Jake Puffer, growers of "Puffer's Petite" Wellfleet Oysters, and we were running late. The air bubbled with the scent of seaweed, snails, and wet sand. We approached Jake, who had on khaki Cabela's, a wide-brimmed hat, a bright smile, and also two Dunkin Donuts cups in his hands (mmm coffee!). At that point, the sun had just come up over the horizon and it cast a beautiful pink and gold glow across everything. Our official welcome to Wellfleet couldn't have been more picturesque. Wellfleet has been renowned for its bountiful bivalve population for centuries. French explorer Samuel de Champlain even named it "Port Aux Huitres" in 1605. By the early 1800s, the wild oyster fisheries were exhausted and early forms of aquaculture took its place. Today's Wellfleet oysters are as popular as ever. Wellfleetians and "washashores" (non-natives of the Cape) alike still celebrate its awesomeness at the annual Wellfleet Oyster Festival in October. 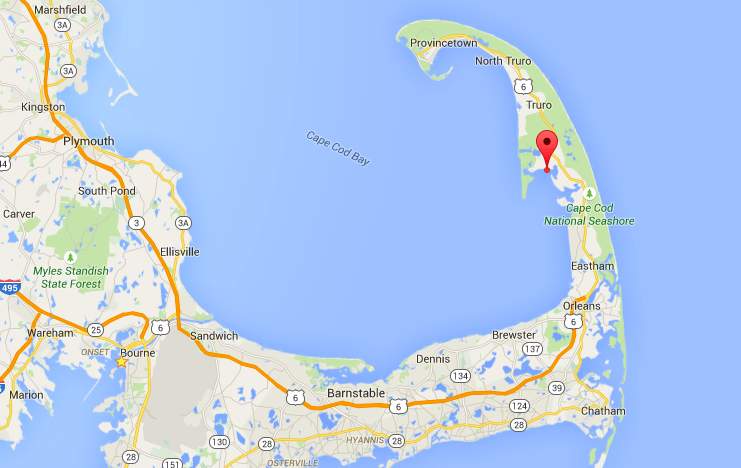 Puffer Oyster Farm is located on the tidal flats of Mayo Beach, amongst one of the oldest oyster beds in the state. A confluence of geographic and climatic factors contribute to its productivity. 10 to 12 feet of seawater flow in and out of the harbor daily, bringing with it rich nutrients from the Gulf of Maine. In my mind (and this is based on zero scientific background), the "arm" of Cape Cod acts like a giant icecream scooper against the Gulf's counterclockwise circulation. Wellfleet just happens to be in the right place at the right time. Working by the tide makes office hours a little weird. The Puffers, along with every other oyster farmer in the area, only have a three-hour window to do what they need to do before the tide rises. This time frame also shifts an hour every day, so no two days in the week are alike. I struggled to wrap my head around the realities of this lifestyle so early in the morning, but it nonetheless filled me with awe. After guzzling some coffee, I kicked off my flip flops and walked into the cool water after Jake. We headed towards the makeshift culling table underneath a blue-green striped patio umbrella in the distance. The sweet sound of rumbling oysters grew louder as we approached. Irving Puffer, Jake's father, was already well into the morning cull. When we arrived, he set his oyster gauge down and greeted us with the same bright, welcoming smile, making us feel right at home. Irving has been farming and harvesting shellfish in Wellfleet for about 40 years now, but he treats every day with the same kind of enthusiasm that he had on his first. He grew up in the area (a true Fleetian) and has owned this particular shellfish lease for over 30 years! Although Irving has had his hand in just about every aspect of the seafood business—from wholesale to retail to restaurants—he's scaled back his empire to focus on what he loves doing most: farming. Jake also followed his father's footsteps and is currently in his fifth year of full-time shellfish farming. He started picking oysters from Wellfleet's wild oyster fisheries as a teenager and quickly became hooked. Throughout his life Jake has spent countless tides working for his dad on the farm, in the process learned the ins and outs of aquaculture. While he attended Emmanuel College in Boston, Jake focused on business courses that would help him run the family business after graduation. I was very impressed by Jake's dedication to his family and to this evolving industry, and it has not gone unnoticed within the community either: he was the first-ever recipient of the Wellfleet SPAT Scholarship in 2006. That process starts early summer when we dip our specially made oyster collectors into a solution that involves lime and cement, we let them dry then place them on our bed. After oysters spawn the free swimming larvae eventually need to find a place to form their shell. Our oyster collector or hats provide a favorable place for oysters to attach to and do just that. The lime is what helps build their shell and the cement helps it stick to the hats. Sometime in August the oyster will start to appear as little specks and a few weeks after that they average size of a half inch. Next we “break down” the oyster collects by separating the oysters from the hats and turning them into individuals, ready to go into grow out bags. Oyster hats aside, the Puffers own a remarkably eclectic collection of gear. "We've tried a little bit of everything," chuckled Irving. I looked around and recognized several different styles of racks, bags, nets, and cages, but there were also a few that I had never seen before (like that pyramid contraption in the photo above). The French-style rack and bag system has been their grow out method of choice. Bottom planting is also done for larger oysters. Their experimental spirit also led them to a one-time purchase of triploid (non-reproductive oyster) seed. While triploids are reputed to be faster growing, they didn't catch on with the Puffers. Collecting their own from the area proved to be far more efficient and satisfying. So after a short stint with the "blondes," (Irving's nickname for the lighter colored Triploid oysters) they reverted back to planting wild set. Advances in aquaculture technology has helped in many ways, but the Puffer's secret weapon are their own hands. Every oyster is hand graded and sorted. To an outsider, the effort -- sometimes as inconspicuous as picking an oyster up and setting it down -- looks simple. In reality, this critical step requires eagle eye precision and lots of handling experience. The margin for error that separates happy end-customers and the not-so-happy ones is absurdly small. There's no room for shuck ups. Oysters for breakfast? Somebody pinch me. Irving swiftly shucked one of his oysters and handed it over. I held the glistening shell in my hand and felt its weight. The coal and chocolate-colored outer shell revealed a bright white interior. The edges of the cup were tinted purple. But before I slurped, I had to take a #shellfie. The liquor of the Puffer's Petite hit my palate first with a cool, oceanic splash. Very high salinity (32-33 ppt) at the nose, but then it opens up to a deep, rich array of earthy and meaty flavors. I often relate this savory kind of taste to that of salumi. Perhaps a sweet prosciutto di parma in this case. Only a handful of environments in the Northeast imparts such a magnificent trait. The meat was quite supple, and I tried my hardest not to scarf them down too hastily. After half a dozen or so delicious Puffer's Petites, Michelle and I assumed our experience was complete. But that wasn't all. Irving had a surprise for us. He picked up a MONSTER-sized oyster from out of nowhere and plopped it down on top of the shellfish pile. Measuring in at nearly 7 inches long, this behemoth bivalve made all of the other "market-sized" oysters look pathetically puny. I simply had to try it. The top shell was removed in two pieces (it broke mid-way) and the bottom adductor disconnected. I wish I had a video of me slurping this puppy, but I don't. You will have to just take my word for it. Holy moly, it was amazing!!! Getting a taste of Wellfleet with Irving and Jake Puffers was a true honor and delight. I had my first Puffer's Petite on the first day of 2014 and still enjoy them in the city today. If you're visiting the Cape, be sure to look out for their blue-green umbrella in the water! As much as I love oyster farms and oyster bars, there's no denying the importance of purveyors and distributors. Purveyors and marketing companies help create demand. The best companies help educate their customers, who in turn, help inform the consumers. Meanwhile, shellfish distributors are like the veins in your body. They help get the raw goods from point A to point B in the most efficient way possible. Larger oyster farms often perform these functions in-house, but there are hundreds of small, independent growers around the country, like the Puffers, who rely on having such partners. After saying goodbye to Irving and Jake, and taking a much-needed nap, we headed out to our next meeting with Alex Hay at the Wellfleet Shellfish processing facility. In 2012, the Wellfleet-based fishmongers at Mac's Seafood bought Wellfleet Shellfish Company—one of the largest shellfish marketing groups on Outer Cape Cod. Mac and Alex Hay, the two brothers who own Mac's Seafood, were known as trusted buyers and sellers of local seafood. They own a portfolio of restaurants on the Cape (including the super-fun Mac's Shack, which we enjoyed after a death-defying trek around Cape Cod National Seashore... another story altogether) and several retail markets. 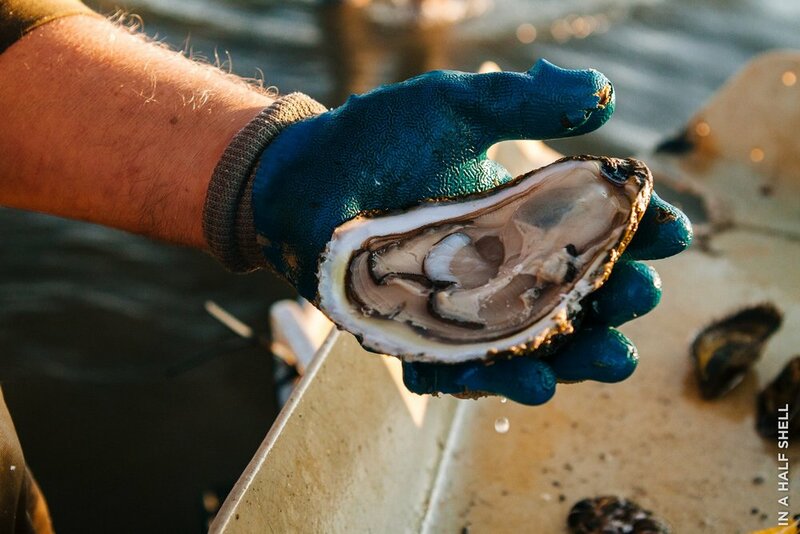 We got a peek into what actually happens after the oysters are harvested. Plastic milk crates of oysters are dumped onto a stainless steel table. They're first hosed down thoroughly, then graded, and then bagged up for shipment. The inside of the facility is kept nice and cool, despite the blistering heat outside. These Wellfleet oysters originated from several different farms, including the Puffers'. The most premium grade of oyster is known as the Wellfleet Royale. They must meet strict size, weight and shape requirements. Only the best of the best become Royales. Wellfleet Shellfish also deals in clams, scallops, and mussels (oh my!). We sampled a few of the Wellfleets on the table. Super delicious. Thank you for the tour Alex!